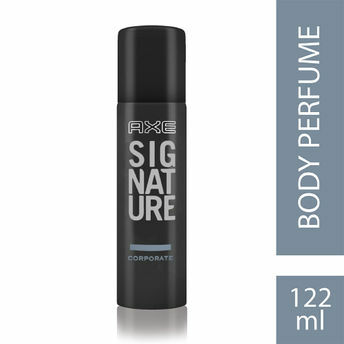 Make your mark with Axe Signature Corporate Body Perfume. This mild and long-lasting perfume is understated and perfect for the office, making you smell great without being overpowering to others around you. A power-packed concoction of spicy cardamom, sweet vanilla and warm woody notes. Elegant yet powerful, this fragrance lasts up to 24 hours giving you long-lasting all-day freshness. The sophisticated and enticing aroma of this perfume will ensure you leave a lasting impression both inside the office and outside. Complete your morning preparation with the unforgettable fragrance of Axe Signature Corporate Body Perfume. Simply spray it directly on your skin, underarms, chest and neck. Add that extra twist to your style. Like you’ve got something different from the rest, helping you make an impression that lingers on. Don’t fade away like the rest. Catch attention and arouse curiosity in the moments that count. Leave your signature with the Axe Signature range of body perfumes.